A typical Long Island Iced Tea -- also called a Long Island -- is a very strong drink that contains four hard liquors and one liqueur plus two mixers. 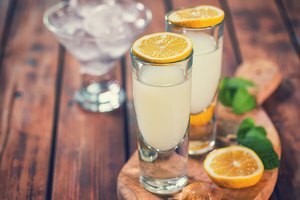 To make a virgin, or nonalcoholic, Long Island Iced Tea, you'll need to skip the alcohol and opt for other tasty liquids, as does this recipe inspired by "The Daily Bruin." Pour the tea, apple cider and lemon juice into the cocktail shaker and shake vigorously. A traditional Long Island is shaken just once but hard enough to form a small amount of foam at the top of the liquid. Lemonade can be substituted for apple cider in this step, if you prefer. Some traditional Long Island Ice Tea recipes call for orange juice, but this is likely to produce an unappealingly bitter taste. Pour the contents of the cocktail shaker over ice and into the pint glass. Pour ginger ale into the glass until it is full, then garnish the drink with a lemon wheel or a couple of maraschino cherries. Make a frozen Long Island Iced Tea by combining all of the ingredients in a blender and blending until the mixture is almost smooth. 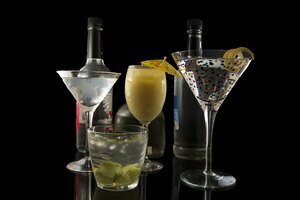 Avoid over-blending; the drink should retain small bits of ice when finished. 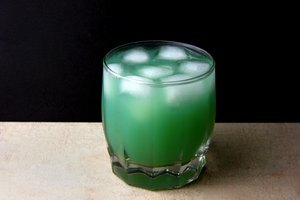 Food coloring can help boost the fun factor of nonalcoholic cocktails. Give your virgin Long Island a tropical flair with a drop or two of blue food coloring. How Many Liquors Are in a Long Island Ice Tea?